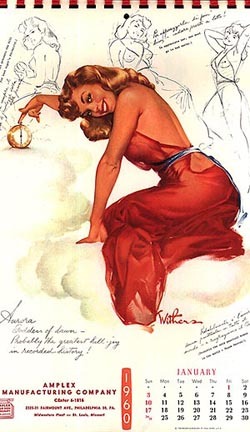 The BEST in Vintage PinUp Calendars only from VNP! These are rare, and available in very limited quantities. They are large format measuring 9" x 14" or larger and were a little too wide for my scanner! VNP Logo on web image only, not on calendar. Sleeves may show slight wear. Prices quoted are in US funds (USPS Confirmed shipping in US). MINT/NEAR MINT condition. These glossy blotters have monthly calendars dating back to 1957. They measure 3.25" x 6.25" and have light blue blotter paper on the reverse. The matchbooks date back to around 1952 and are standard size. 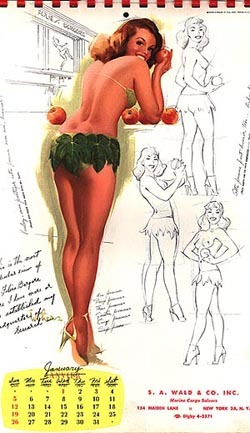 Check out the images by Gil Elvgren!! Images may vary slightly from those shown. MINT condition with original pictorial outer sleeve entitled "A Theory of Curves". This 12 month full color calendar has never been handled or seen the light of day. It was in storage in a NYC office ever since 1950. You will never find one in better condition than this. MINT condition with original pictorial outer sleeve entitled "Following a Star in the Artists' Sketch Pad". This 12 month full color calendar has never been handled or seen the light of day. It was in storage in a NYC office ever since 1951. You will never find one in better condition than this. MINT condition with original pictorial outer sleeve entitled "Ad-ventures in the Artists' Sketch Pad". This 12 month full color calendar has never been handled or seen the light of day. It was in storage in a NYC office ever since 1952. You will never find one in better condition than this. MINT condition with original pictorial outer sleeve entitled "Just What the Doctor Ordered - the Artists' Sketch Pad". This 12 month full color calendar has never been handled or seen the light of day. It was in storage in a NYC office ever since 1953. You will never find one in better condition than this. Very Good condition with spiral binding. No slipcase. This 12 month full color calendar features some of Hefner's most beautiful Playmates. Very Good condition with spiral binding. No slipcase. This 12 month full color calendar features some of Hefner's most beautiful Playmates. How about that Connie Kreski! FABULOUS! NEAR MINT condition with spiral binding. Original slipcase, worn with split sides. This 12 month full color calendar features some of Hefner's most beautiful Playmates. MINT condition with spiral binding. Original slipcase in Excellent Condition. This 12 month full color calendar features some of Hefner's most beautiful Playmates. MINT condition with spiral binding. Original slipcase in Near Mint Condition. This 12 month full color calendar features some of Hefner's most beautiful Playmates. Fair condition with soiling and slight damage. No slipcase. Measures approximately 9" x 12". 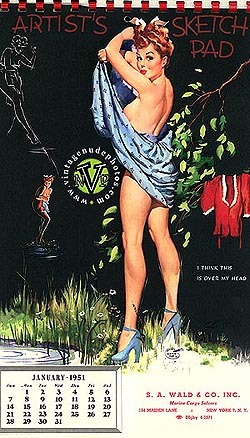 Hard to find item showcasing those fabulous Esquire Pin-Up illustrations of yesteryear by J. Frederick Smith. Very Good condition with slight soiling. Includes top cover page. No slipcase. Entitled "Ah, la Belle France! - the Artists' Sketch Pad", all of the Pin-Ups in this spicy calendar have a decidedly French accent, if you know what I mean! This 12 month full color calendar measures 9" x 14". LARGE! Entitled "Cheesecake for Caesar in the Artist's Sketch Pad". GREAT! MINT condition with original pictorial slipcase. This is one of the best of the Withers calendars, as far as I'm concerned. It captures the essence of the "Cheesecake" era with incredible artwork, a la Withers, of gorgeous women in all of their curvaceous glory. This 12 month full color calendar measures 9" x 14". LARGE! MINT/NEAR MINT condition. This is one of those terrific calendars with a "concealing" plastic sheet over the buxom blonde cutie image beneath. Just lift the sheet and this little cutie is fully exposed! 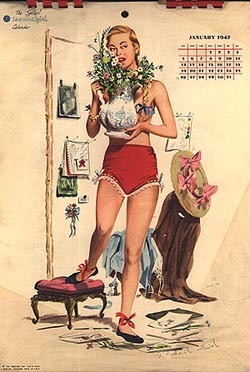 I remember seeing this type of calendar in the auto repair shops of the 50s and 60s. VERY COOL! Includes original 12 month calendar pad. Measures 10" x 16".